THERE IS A crisis in Irish restaurants as the chef shortage worsens. The country needs at least 5,000 new chefs by next year to ensure more restaurants won’t close. That’s according to the Restaurants Association of Ireland which says that the main skills shortages are among suitably qualified chefs. “Among the applicants submitted for chef positions, many are deemed not to be appropriately qualified,” the group said in a statement this morning. The organisation is calling on the Minister for Education Jan O’Sullivan to re-establish CERT, the former State Tourism Training Agency. It offered training courses for those wishing to pursue a career in the hotel, catering and tourism industry and for employees who wanted to develop new skills. It was abolished in 2003. Chief executive of the RAI Adrian Cummins said, “Some restaurants across the country are facing mid-week closures due to the shortage of chefs. The hospitality and tourism industry is one of our most valuable assets. It is ludicrous that there are no training colleges for our industry. 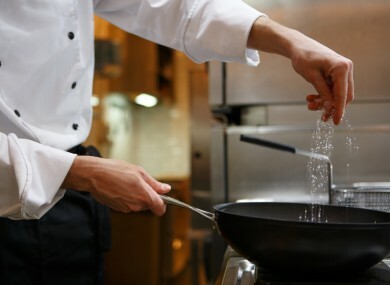 Currently 1,800 chefs qualify from certified culinary training programmes each year but the RAI says there is an immediate deficit of 5,000 chef trainees annually. Cummins added, “We want to be able to market Ireland as a centre of food excellence, a true culinary experience with world-class chefs leading the way. Email “A shortage of chefs is forcing Irish restaurants to close ”. Feedback on “A shortage of chefs is forcing Irish restaurants to close ”.